UFO Series 2 BOX Autograph Trading Cards UFO Series 2 HOBBY Autograph Trading Cards BOX. These fantastic limited edition boxes contain a guaranteed 4 different genuine hand signed autograph cards from stars from the classic Gerry Anderson Television series, actors and behind the scenes creators, OR or 3 autograph cards plus 1 rare SketchArt sketch card, or rare "CUT" actor Autograph card. 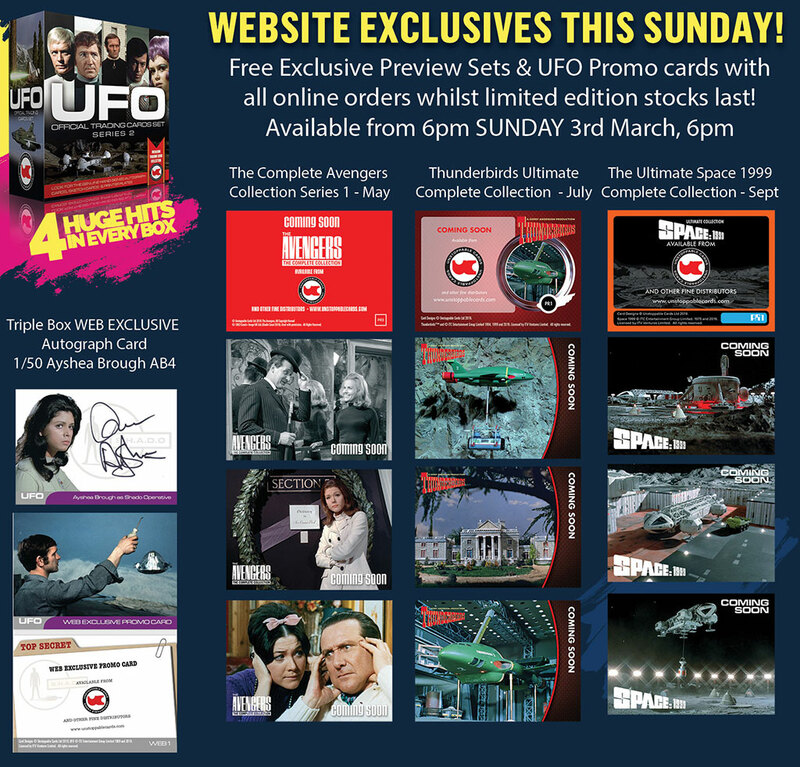 In addition to the boxes, all pre-orders come with our exclusive 10 card collection, including all new advance limited edition triple card preview sets numbered 1/100 for Thunderbirds Ultimate Collection, The Ultimate Space 1999 & The Complete Avengers Collection Series 1plus UFO WEB 1 promo card. UFO Series Two Trading Cards Series is a limited edition of only 1,199 boxes worldwide.